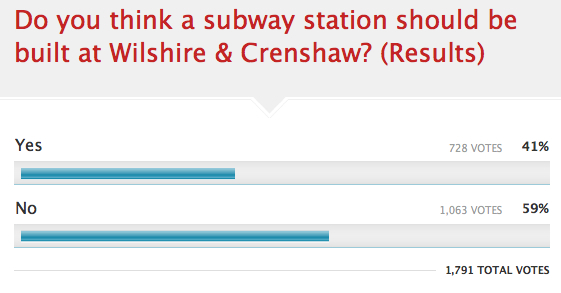 We asked readers a week ago what they thought about the prospect of a station at Crenshaw & Wishire on the Westside Subway Extension and above is the response we received as of 10:20 Monday morning. More than 30 comments were left on the Polldaddy page and they cover the gamut of opinions — from those who think leaving Crenshaw without a station is bad urban planning to those who think the money would be better spent on stations on the Westside that would likely having more boardings. I’ll post the second of our series of subway polls later today. This one will ask readers for their opinion of where it’s best to put a Century City station.